Enter The Gungeon, originally released on various platforms in 2016, is a roguelike blast-‘em-up in which you can play as a bullet who shoots bullets at other bullets from guns shaped like bullets that fire guns that fire bullets. 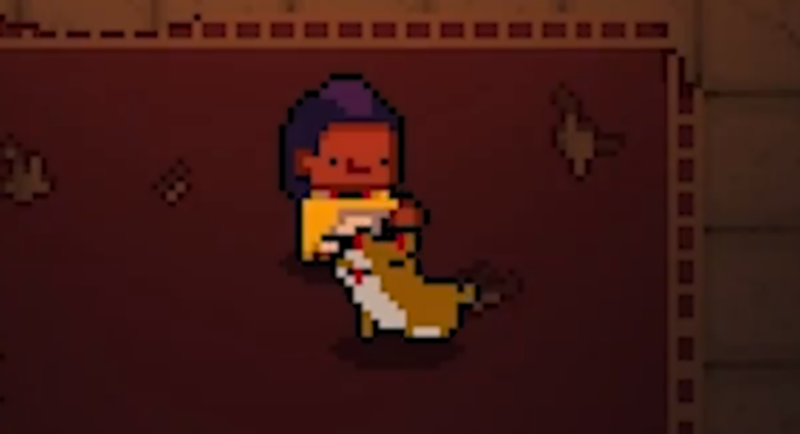 You can also, as of last week, pet the dog, the default companion of the game’s Hunter class. Until that point, this dog was perhaps history’s most unfortunate canine, having done a very good job since 2016, but receiving no pets. This will surely come as a relief to fans of the recently-popular Twitter account @CanYouPetTheDog, which is dedicated to answering what is clearly the most important question about any video game. It gave Enter The Gungeon a failing grade back in March. Upon being alerted to this, Enter The Gungeon designer Dave Crooks realized the error of his ways. “Hold my beer,” he said on Twitter at the time. Then, last week, Enter The Gungeon’s final update, A Farewell To Arms, came out, and the dog was finally freed from its nightmare mime bubble of un-touchability. Behind the scenes, though, it took a lot of careful work to implement the dog-petting, since the feature was added just as development was coming to a close. Anything involving player movement, Crooks explained, was “risky,” and the QA testing process for the rest of the update was already complete. “It was described to me as the most cautious piece of code Rubel had ever written,” said Crooks. But once it was in, it became clear that it was “a great idea,” and the team even put it in the trailer for A Farewell To Arms. Crooks, Rubel, and the team actually decided to put the feature in before Crooks sent the now-infamous “Hold my beer” tweet, but still say it wouldn’t have happened if not for the efforts of the Twitter account.